Dr Helen Kara is an independent researcher who, alongside undertaking commissioned research related to health, social care and the voluntary sector, teaches and writes about research methods. Helen is author of Creative Research Methods in Social Sciences: A Practical Guide and Research and Evaluation for Busy Practitioners and alongside this has published independently a number of e-books for doctoral students. It is these e-books that I want to draw your attention to here, specifically Starting Your PhD: what you need to know which is available to download for free. 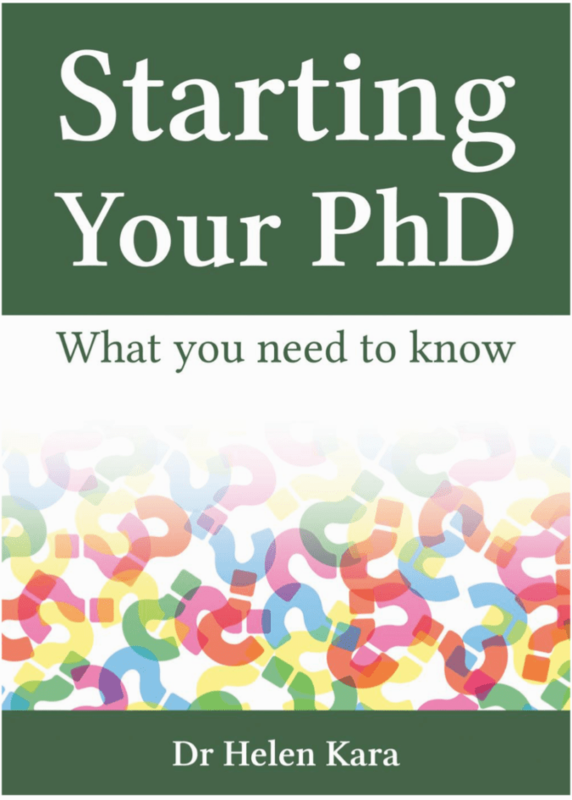 This book is concise and to the point and will act as an introduction to the whole of the PhD process and be of value to anyone considering starting a PhD as well as those in the midst of their PhD journey. The book is written in a question and answer format and covers many of the questions I get asked most frequently by people thinking about starting a PhD. If you are in the midst of your PhD some of the questions will provide you with reassurance that you are not the only one struggling with issues such as how much data is enough?, do I need to publish while I’m doing my PhD? and how can I overcome isolation? The book starts by exploring topics such as: the different kinds of PhDs; fitting study into an already busy life; will it be too hard? ; finding a supervisor; keeping motivated. All of which are common questions to ask when considering whether or not to take a significant step into what, for many, is the unknown. The book then progresses to consider more skills focused topics including: refining a research question; choosing a method; writing a proposal. The final focus of the book is on topics relevant to writing up and dissemination exploring topics such as: when should I start writing; why do I need to present my work at conferences; what if someone asks me a question I can’t answer. At the end of the book there is a useful resource section with links to other resources and sources of information. The book is concise and therefore by its nature should be read as an introductory text. It is easy to read and well worth downloading as a reference book and for anyone supervising PhD students it’s a helpful resource to refer people to. There is something incredibly heartwarming about the generosity of researchers in sharing their time, skills and expertise and their willingness to support the growth and development of the research community. In making this publication freely available Helen is testament to this.